Thanks for stopping by WEC Inlay, hand crafting replacement decorative truss rod covers, and decorative plaques and pieces. 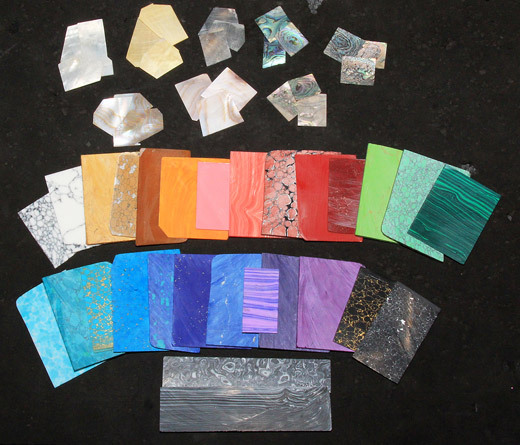 I have a multitude of materials to choose from for your design. Please remember, that no two pieces of shell or stone, will be exactly alike, which is part of the beauty and uniqueness each inlay will have. I have the most common woods that will match either your headstock or fingerboard, and more exotic woods as well, should you really want the piece to "pop" so to speak. All pieces are available with either an oil finish, or a coat of gloss sprayed over. Both finishes bring out the beautiful color and figure in both the inlay and wood. Feel free to choose any of the designs in the galleries, as most can be adapted to the cover you need it for, or send me a custom idea you may have in mind. I primarily make covers for Epiphone, Gibson, Guild, Jackson, PRS, Taylor, and Tacoma, but please feel free to inquire with me, if you have a different make you would like a cover made for. While I do have a good number of the most common covers, I may require measurements from you. There are only a few custom designs that I have given my word, that I won't duplicate again. Should you order a custom design, I am happy to extend the same courtesy to you should you wish. All pieces are made one at a time, by hand, the old fashion way. No CnC machining here!! Not just an inexpensive overlay or decal adhered to wood, it is 1-2mm thick shell and stone, that will show different figure and color in different lighting and angles. The appearance of the shell is MUCH nicer in person!! It is hand cut, and hand routed, it is then set in the wood, glued in, sanded flush, polished and hand engraved. I finish them with either a coat of gloss sprayed over it, or an oil finished rubbed in, bringing out the beautiful figure in both the wood, shell, and stone. The covers after sanding and finishing, end up approx. 1.5 - 2 mm. thick. Please take care when mounting the cover to your guitar, as to not over tighten the screws, potentially cracking the wood on the cover! As there are several different screw sizes used to attach truss rod covers to various guitars, mounting screws are NOT included. Please retain your original screws. Every piece is made from excellent quality wood, and various colors and figures of shell and stone.